“Magnificent at so many levels!” 5 star pioneer ratings! 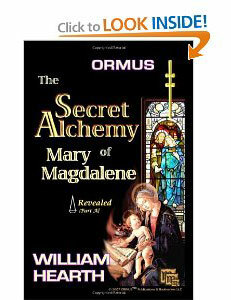 ORMUS ~ The Secret Alchemy of Mary Magdalene Revealed Part [A] is a collection of excerpts from the foundational research supporting the greatly anticipated novel from newly acclaimed author William Hearth. Focusing on events that lead up to the advent of the Jesus Movement in the Levant, Hearth’s upcoming historical romance promises to be both highly entertaining and informative. The points of view, although drawn from timelines commonly accepted in orthodox religious circles, present a new and refreshing set of possibilities and hope for a generation born into a world filled with pollution, concerns of human injustice, endangered species and a world on the brink of complete environmental meltdown. Heart makes the point that History is contrived at best. And Mary Magdalene’s history was not immune to corruption, as it has also been rewritten, time and again, to suit the whims and private agendas of countless despot rulers, both during her lifetime as well as centuries after her tenure in the Levant. Even today authors offer unruly and absurd assumptions concerning her history and person. 3 Responses to “Magnificent at so many levels!” 5 star pioneer ratings! We’re hoping you’ll join us in extended civil debate and the continued pursuit of in-depth exploration… welcoming all those people who, are genuinely interested in discovery of truth as regards the possibly inaccurate description of various well-known biblical characters such as Mary Magdalene, Judas Iscariot (Sicarii), Saul (Paul) of Tarsus, and the Essene Community at large. These so-called historical and theosophical “facts” are rapidly becoming the source of serious and widespread controversy, disagreement and in many instances, heated debate. Dissent and the attendant right to question authority in a gentle and sophisticated manner, is a good thing. It is the sociological treasure of a sophisticated and civilized society~ But this healthy attitude, being born of a heretical mind-set, is behavior that is all too often misunderstood and hence, degraded; however, so long as it remains nothing less than the distilled result of deductive reasoning, this open-minded approach to life should be both revered and protected by a civilized society. We should accord all due respect to such considerate reasoning, regarding it as the very root of sanity. Sanity is sacred and as such, an enlightened heresy should be the commonly accepted root of a healthy lifestyle. Take no man’s word for it!